Extra info: hull size 97,5" X 20,5" x 9,10"
The Maxi 88 "Moonlight II of London" is a great entertainer. This Maxi 88 is built in 1992 built by the C.I.M. yard in Rochefort, France, now known for the construction of Nautitech catamarans. The Maxi 88 has a huge and very well protected social cockpit providing both shelter and comfort while sailing or at anchor. The Maxi 88 is perfect for the adventures owner that wants to cross the oceans or charter the Riviera. She accommodates 8 guest in 4 double cabins with en suite and up to 4 crew each with a private cabin. 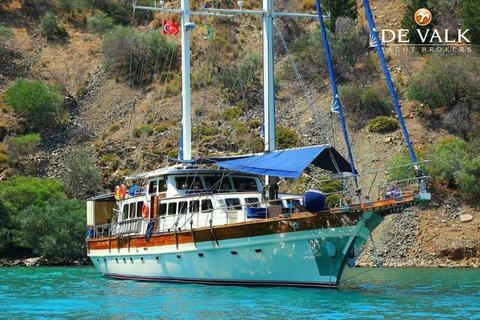 A spacious professional galley with crew mess ensures the owners privacy.